The properties of bitumen offer good opportunities to apply this type of material in railway track construction. Bituminous Ballast as Sub Ballast Layer. The rail ballast absorbs the train weight and distributes it from the rails to the sub grade, thereby avoiding any deformation. 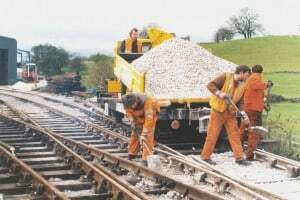 The rapid decay of the railroad level which occurs with traditional ballast construction is mainly due to the unsatisfactory “fatigue behaviour” of the ballast; this is mostly due to embankment settling. 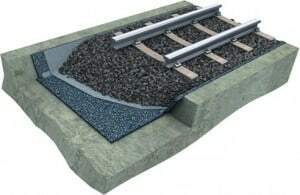 By interposing a special semi-rigid layer (the so-called “sub-ballast”) in the area between the ballast and the embankment, the behaviour of the overall structure is greatly improved. The sub-ballast is normally laid on a highly compacted embankment layer. This consequently eliminates fatigue cracking. Especially on high-speedtracks maintaining levels and profile is of high importance. When a layer of dense bituminous concrete is used as a sub-ballast layer, optimal drainage of the total structure will be realized. The impermeable bituminous ballast as sub-ballast layer can prevent possible contamination of the sub-structure by vertical hydraulic transport of mud and fines. ballast by the bituminous ballast layer, the ballast layer is strengthened and deterioration of the ballast is reduced. The bituminous ballast as sub-ballast layer increases the foundation modulus, providing a more rigid foundation, with the effect that there is a reduction of tension and shearing stress inside the ballast material, with consequently less fatigue and less degradation and wear of the individual aggregate particles. Because of the low air voids in the mix (1 – 3%) and because the bituminous ballast layer is buried, weather effects (temperature changes, Ultra Violet radiation, oxygen) will not affect the hot mix, so no deterioration (aging) of the bitumen will take place. Even if limited deformation of the sub-soil does take place, this will not affect the bituminous ballast layer because it is capable of withstanding the deformation without loosing its integrity because of the visco-elastic properties of bitumen.